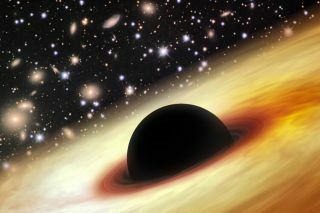 An artist's illustration of a monster supermassive black hole at the heart of a quasar in the distant universe. Scientists say the newfound black hole SDSS J010013.02+280225.8 is the largest and brightest ever found. Astronomers have discovered the largest and most luminous black hole ever seen — an ancient monster with a mass about 12 billion times that of the sun — that dates back to when the universe was less than 1 billion years old. It remains a mystery how black holes could have grown so huge in such a relatively brief time after the dawn of the universe, researchers say. Although not even light can escape the powerful gravitational pulls of black holes — hence, their name — black holes are often bright. That's because they're surrounded by features known as accretion disks, which are made up of gas and dust that heat up and give off light as it swirl into the black holes. Astronomers suspect that quasars, the brightest objects in the universe, contain supermassive black holes that release extraordinarily large amounts of light as they rip apart stars. So far, astronomers have discovered 40 quasars — each with a black hole about 1 billion times the mass of the sun — dating back to when the universe was less than 1 billion years old. Now, scientists report the discovery of a supermassive black hole 12 billion times the mass of the sun about 12.8 billion light-years from Earth that dates back to when the universe was only about 875 million years old. This black hole — technically known as SDSS J010013.02+280225.8, or J0100+2802 for short — is not only the most massive quasar ever seen in the early universe but also the most luminous. It is about 429 trillion times brighter than the sun and seven times brighter than the most distant quasar known. The light from very distant quasars can take billions of years to reach Earth. As such, astronomers can see quasars as they were when the universe was young. This black hole dates back to a little more than 6 percent of the universe's current age of 13.8 billion years. "This is quite surprising because it presents serious challenges to theories of black hole growth in the early universe," said lead study author Xue-Bing Wu, an astrophysicist at Peking University in Beijing. Accretion discs limit the speed of modern black holes' growth. First, as gas and dust in the disks get close to black holes, traffic jams slow down any other material that's falling into them. Second, as matter collides in these traffic jams, it heats up, emitting radiation that drives gas and dust away from the black holes. The newfound quasar SDSS J0100+2802 has the most massive black hole and the highest luminosity among all known distant quasars, as shown in this comparison chart of the black hole's mass and brightness. Scientists still do not have a satisfactory theory to explain how these supermassive objects formed in the early universe, Wu said. "It requires either very special ways to quickly grow the black hole or a huge seed black hole," Wu told Space.com. For instance, a recent study suggested that because the early universe was much smaller than it is today, gas was often denser, obscuring a substantial amount of the radiation given off by accretion disks and thus helping matter fall into black holes. The researchers noted that the light from this black hole could help provide clues about the dark corners of the distant cosmos. As the quasar's light shines toward Earth, it passes through intergalactic gas that colors the light. By deducing how this intergalactic gas influenced the spectrum of light from the quasar, scientists can deduce which elements make up this gas. This knowledge, in turn, can provide insight into the star-formation processes that were at work shortly after the Big Bang that produced these elements. "This quasar is the most luminous one in the early universe, which, like a lighthouse, will provide us chances to use it as a unique tool to study the cosmic structure of the dark, distant universe," Wu said. The scientists detailed their findings in the Feb. 26 issue of the journal Nature.